They say that you must know where you've been to know where you're going. 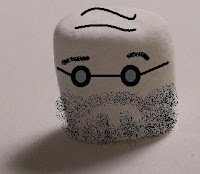 So taking a cue from that logic, let me give you a little spot history of the marshmallow. Marshmallow was a plant long before it became associated with the sticky goo that bound a billion boxes of cereal. As you might have guessed, it likes to grow in a marshy environment. The roots contains mucilage, a thickening agent that when mixed with water creates a jelly like consistency. All the way back to the Egyptians there is record of this being mixed with honey to create something similar to the processed food we all know and tolerate. Marshmallows were innovative back in the day. Scores of families where brought together toasting them around campfires. S'mores even now remain a staple for scouts. When the pairing with cereal was discovered, magic happened. Then of course there was chocolate with marshmallow and marshmallow peeps. At some point it began appearing in the lunch boxes of children sandwiched with peanut butter. Which leads me to this conjecture, what the heck has it done for us lately? It's been years since marshmallow has done anything worth notice. The former king of originality has lain dormant for years. One can only coast on previous achievements for so long before falling to the side as newer and better replacements find their way into the public eye. Sadly this is the case for the marshmallow, and why I must rate it's last few years low. But with the right push hopefully we'll see it bounce back out of the sticky situation it's currently in. It was this kind of righteous anger at something that can't possibly care that you hate it that appeal to me about your blog. You also claim to speak for the kitties which I always enjoy. I look forward to seeing you on the street corner across from mine. I will be interested in seeing your opinion on the cephalopod menace we all face. The regular size marshmallows come in berry flavor now, Progress!! I hate them, to be honest. Except in Rice Krispie squares. I mean, who could hate those?